Michigan unions rally for veterans’ health care | Fight Back! 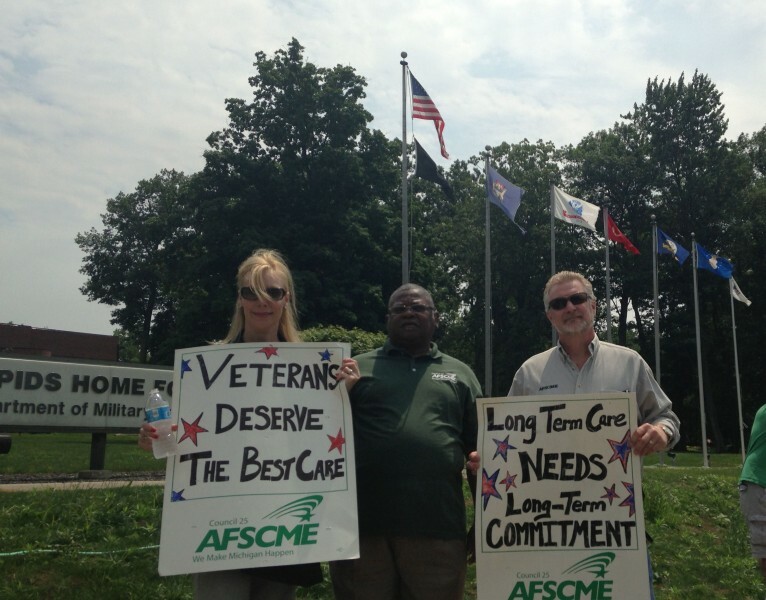 Trade unionists rally for veterans’ health care. 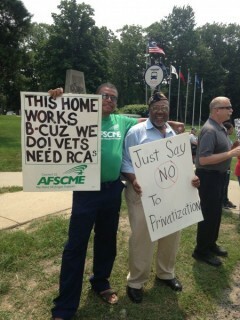 Grand Rapids, MI - Giving new meaning to ‘soldiers of solidarity,’ U.S. veterans joined fired health care workers to rally in front of the Grand Rapids Home for Veterans on the afternoon of July 1. The action, involving nearly 100 people, exposed Michigan Governor Rick Snyder’s privatization schemes, in this case leading to neglect and abuse of veterans. Longtime resident care aides employed by the state of Michigan were fired, and their jobs privatized by the non-union J2S Group, a for-profit company that refuses to speak on the matter. Veterans and fired union workers say military patients are endangered by low staffing levels and poor training that leads to substandard care under the J2S Group. The privatized workers are paid $10 an hour – less than half the pay and benefits the unionized health care workers had. J2S is struggling to fill full-time positions and retain employees.